As a reminder, these kind of posts are not a review, but a post just about how I’m feeling so far while playing and any thoughts about the game in general. I had been following this game on and off ever since a friend showed me Starbound ages ago. I was excited then as I really love the Harvest Moon series, even if I’ve been disappointed with the latest game. I ended up not really liking Starbound between just having a hard time getting into it, all the crafting elements, and all the enemies. 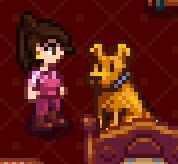 I also was already getting a bit tired of 2D platformers then, but I still tried to check in on Stardew Valley every so often. The only thing I didn’t really like were the bachelors. Sadly, I can’t say I like them anymore now ^^; While art style has improved, the art style genuinely never bothered me–I just didn’t find any of the bachelors very interesting. I’m currently going for Sebastian, but I wish there was one that really stood out for me. I do think it’s a very cute game, definitely addictive, and I’ve honestly been enjoying it. I mean, I’ve gotten some pretty bad bugs and still kept playing and for me to keep going, that’s usually a pretty good sign. As most will know, I don’t replay games and I hate repeating progress so even redoing part of a day is kind of a plus for me if I’m enjoying a game, as silly as that may sound. 1. Random crashes in general. Not the end of the world, but the worst are right when I’m going to bed to save. I wish you could save whenever and not just when you go to sleep. It’s one of those features I’m so glad Harvest Moon added and I’m sad they aren’t here. Or if you buy too much and your inventory is full. Unfortunately, you can just click something and you will immediately buy it. I’ve accidentally bought furniture multiple times when just trying to scroll through to see what Robin had and one time, my inventory was full and I accidentally hit a window. There is no way to discard it. I was just stuck there until I closed the game out. 3. 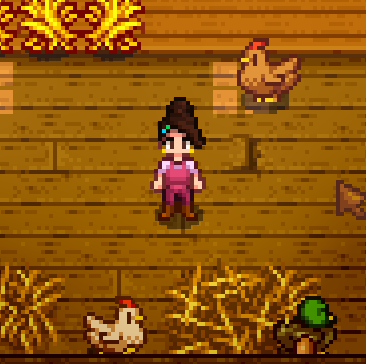 And the worst one of all, a crash that happened shortly after a save caused Robin to think she was still building my coop while also knowing it was done. 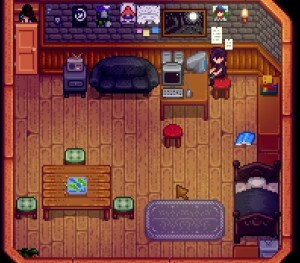 She was back at the store, but I could not make any new buildings or do anything beyond buy furniture (like what happens when you already started a new building plan). In the end, a friend of mine had to use a save editor to help fix this, but I had to go a while without being able to build anything. 4. Similarly, there was one point where my save file completely disappeared due to a crash like the above, but when I looked at it in Stardew Valley’s saved state folder, it was still there and then reappeared. I will admit, if my save file actually did disappear, I’d probably have been too disheartened to continue. 1. Quests – I wish they weren’t timed. I already feel like there is so much going on that I genuinely can not find the time to do them. And even if I somehow do, I rarely get to the NPC in time since my map navigation is awful. I’m still having a lot of trouble keeping track of everyone. 2. Community Center – One of my biggest issues with A New Beginning and Story of Seasons was the fact that you needed to hoard nearly everything. The Community Center has that same kind of issue where you need to do so much hoarding in a game where you desperately need to be earning money at the same time. While you can technically pay to make it into a Warehouse where you can then just buy the bundles, I really want to keep it as the Community Center. I just wish there was an option or alternative to give money to it as well while still keeping it the same building. 3. Crafting – In general, we have a Carpenter, I feel like we should just be able to have things made that way or at least be able to buy them rather than just having to make all these things out of our inventory. I really wish we had some kind of tool shed I could put all the materials in at least. 4. The randomness with the worms. I like the idea that they show up to indicate a possible rare item, but after having my game crash one time at the end of the day when I found this really weird skeletal hand from my very first worm spot only to get a book upon reloading since I had to do a day over, I’ve been super discouraged as I have yet to get another one and have seen the worms so rarely despite how long I’ve played. 5. We can’t change our outfits. As someone using a ponytail (And how I wish there were more high ponytails–the bangs kind of bug me), I don’t care for most of the hats. There was over 100 shirt options–I’d love if I could buy them from somewhere and change through a dresser or something. Similarly, skirts/dresses would have been nice over just pants. 6. Fishing is awful. It’s so sensitive and my mouse if already iffy to begin with. I’m not sure a controller would help either. I wish it was just clicking on the hit and then having a chance for there to be treasure. 7. Combat. I never gotten into Rune Factory for the very reason that I prefer combat to be out of my farming games. That said, I don’t find it too awful in the game, but I do wish it wasn’t there. 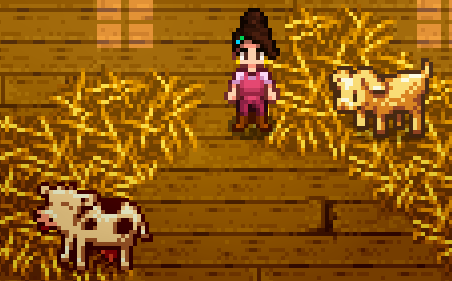 Regardless, I find the game cute, I am enjoying my farm (even if I am still struggling to clear it out. The trees and grass and rocks spawn faster than I can manage), I still think my character looks pretty adorable (and yay for so many color options–though, it’s part of why I wish we could buy more clothes), and it’s a fun and addicting game. My issues are mostly quirks, but don’t really take away from it (If I had to pick what bugs me the most, it’d be fishing and all the Community Center hoarding). If you like Harvest Moon/Story of Seasons, you should enjoy this game. Simple as that. Butterfly Bow – Reach 5 Hearts with a single person. I’m at 4 right now with Sebastian so soon. Chicken Mask – Do 40 quests. This will probably take me the longest due to reasons mentioned above. Cowgal Hat – Ship 300 of a single crop. Daisy – Craft 15 different items. Delicate Bow – Cook 10 different recipes. Finally, Summer (Tropicala) has easily been my favorite song thus far. Dance of the Moonlight Jellies is also quite pretty. I also made a page for some brief summary information on my progress in the game. I most likely won’t make another entry, but I will occasionally upload some footage to Youtube until I’ve finished the game. As always, you can find all Game Diary Pages by clicking Game Diaries on the sidebar. Only those still largely being played or in a lot of progress will appear on the sidebar so it may be fun to check the main page every once in a while!